We'll illustrate the Kaplan-Meier estimator with the classic dataset used by Cox in his seminal paper on proportional hazard models. The data shows the length of remission in weeks for two groups of leukemia patients, treated and controls. We start by reading the data, available in the datasets section of my GLM course at https://data.princeton.edu/wws509/datasets/ as a plain text file gehan.dat and a Stata file gehan.dta. failure event:  relapse != 0 & relapse < . As you can see, 30 of the 42 patients had a relapse, with a total exposure time of 541 weeks. The weekly relapse rate is 7.8%. 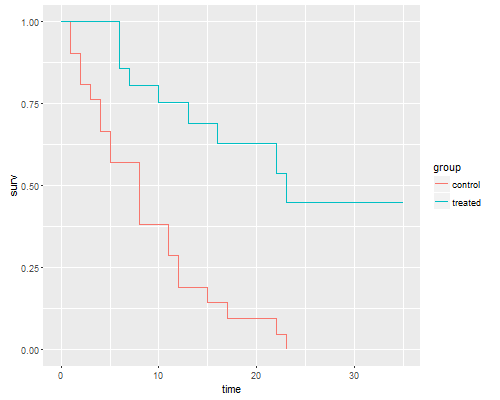 Next we compute and plot the Kaplan-Meir estimator of the survival function in each of the two groups. The graph shows that after 23 weeks all patients in the control group had relapsed, but about half those in the treated group remained in remission. We can list the survival function. 23        1      1      0             0.0000         .          .         . The convention is to report the survival function immediately after each time. 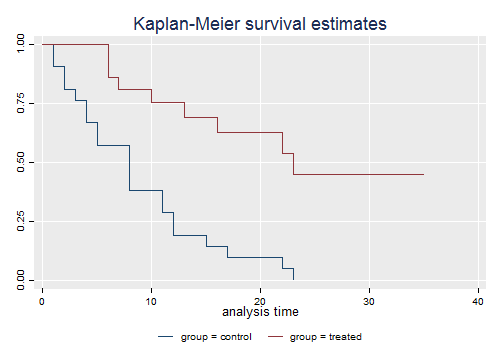 In the control group there are no censored observations, and the Kaplan-Meier estimate is simply the proportion alive after each distinct failure time. You can also check that the standard error is the usual binomial estimate. For example just after 8 weeks there are 8 out of 21 alive, the proportion is 8/21 = 0.381 and the standard error is v0.381(1 - 0.381)/21) = 0.106. In the treated group 12 cases are censored and 9 relapse. Can you compute the estimate by hand? The distinct times of death are 6, 7, 10, 13, 16, 22 and 23. The counts of relapses are 3, 1, 1, 1, 1, 1, 1. When there are ties between event and censoring times it is customary to assume that the event occurred first; that is, observations censored at t are assumed to be exposed at that time, effectively censored just after t. The counts of censored observations after each death time (but before the next) are 1, 1, 2, 0, 3, 0 and 5. When the last observation is censored the K-M estimate is greater than zero, and is usually considered undefined after that.